Django vs Drupal | The Daily Programmer '+g+"
Drupal and Django are two of the most widely used tools in web development. The decision for what tools and frameworks you use for your project needs to be carefully evaluated on key metrics relevant to your requirements. In this short post, we'll be evaluating Drupal and Django, in the hope that it helps clear your doubts for your framework of choice. As we'll see, both are not equally comparable, and are made for users with different requirements. Drupal is more favoured by non-developers, while Django is well-suited for developers. Drupal is LAMP based and, in essence, a CMS, although it allows more customization and features than regular CMS like Wordpress. Django, on the other hand, is a python based framework. As already mentioned, Drupal does not require you to know code, and has a user-friendly interface, so it's suitable for most regular applications, as long as you are not aiming for high customization. Django allows you to manage your application as several independent components, aligning with team project management easily. Django uses version control, which allows multiple users to work on the same application simultaneously without overwriting modifications. Drupal however, depends on database, so collaboration is difficult. 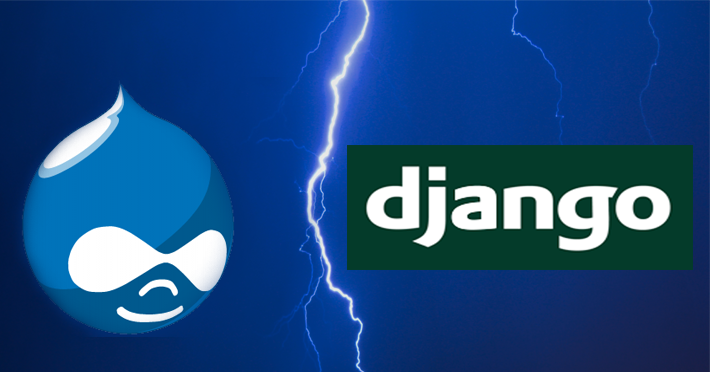 So, which one do you prefer - Drupal or Django?